Want to view your transactions on the go? 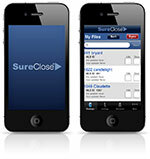 Download the SureClose Mobile App for Apple and Android mobile devices. This handy app enables users to view a list of current files and documents; see a summary of each transaction; view and share documents via email; and check status and stay up to date. Enter the email address associated with your account (you cannot use the "@mysureclose.com" email address). Click Submit to receive your login information.